So much of teaching (at least in a traditional classroom format) is thinking through logistics. Timing. Instructions. Materials. We have a lot of room for creativity, but we have to think carefully to make our classroom activities effective. It is almost as if we are choreographing a dance or coming up with game plays. One aspect that takes forethought and strategic planning is that of grouping students for activities. Two common proverbs reflect the dynamics at work here. Two heads are better than one, right? There are many benefits to pair- and group-work. However, too many cooks spoil the broth. Many of us have experienced working in a team where we felt like we were wasting time and being distracted from the main task. Or perhaps you found that as the team moved ahead, you weren’t given enough time to process and form your own ideas. I believe the guiding principle should be your lesson objectives. These will inform the size and make-up of your activity groups. For example, how many students are needed to create a context for authentic communication? Spark creativity and an exchange of ideas? Develop the skills of problem-solving and teamwork? Complete the experiment and formulate a number of hypotheses? The ideal grouping, usually between 2 and 5 students, is one that creates the conditions to achieve your objective while allowing every student to participate and benefit. Once you have decided group sizes, the next step is to decide how you will organize the students into groups. May I suggest that you think about this before you go into the classroom. In order to save time especially in large classes, you could set up prearranged groups that you use every class throughout a semester. Again, guided by your lesson objectives, you could divide learners by same level or different levels. You could also form groups randomly. Be creative with this! For example, use numbers, the alphabet or vocabulary sets (basketball, soccer, tennis, volleyball, basketball….) to divide learners into groups. Or, refer to student’s clothing, weekend activities, or birthdays. (Find two people wearing the same color as you. Find someone who did one of the same things last weekend as you did.) One caution, though: don’t let the process of forming groups use up too much classroom time or distract the students. Don’t be creative for creativity’s sake; be creative for the sake of the students’ progress. When students participate in a well-designed pair or group activity, they will experience heightened creativity and capacity for learning. They will develop interpersonal skills. They might even be challenged to think critically. Let’s give our students this gift. For more on different types of group activities for different purposes: Group Work in the Classroom. For more on how to divide students into groups: Grouping Students. For more on grouping students by same or different levels: Student Learning Groups. What are some different ways you organize your students for pair- and group-activities? Which aspect of organizing pair- and group-activities is most challenging for you? Is there another teacher you can talk with or observe for ideas? What can we do if students are resistant to pair- and group-work? Carolyn Stent has an M.A. in TESOL. 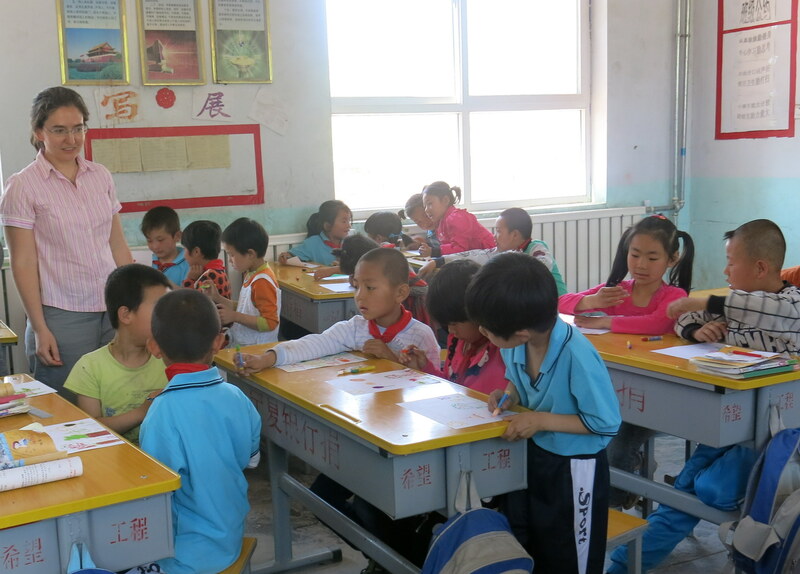 She has taught a variety of university English skills and culture courses in Ningxia, China since 2004. She has experienced the truth of the saying “two heads are better than one” as she has co-planned and co-taught with both American and Chinese colleagues. “Don’t be creative for creativity’s sake; be creative for the sake of the students’ progress.” This is such a well-stated principle, and so freeing for the instructor. Great post, Carolyn! Choreographing a dance, devising game plays, crafting lessons–All require intentional, detailed planning. Thank you, Carolyn, for writing this post, a reminder that a teacher’s hard work comes before class. When our students successfully meet lesson objectives–whether on their own, in pairs, in small groups, or in a whole-class setting–we see the value of thoughtful, strategic lesson design. This entry was posted on May 1, 2018 by LEAPAsia in Carolyn Stent, group work, learning activities.